This super rare tube was magical, it that it did everything beyond perfect. Dynamics and micro-detail were astonishing and noticeably better than any other 12AX7 in the test. It was unanimous amongst the reviewers that this was their favorite tube. 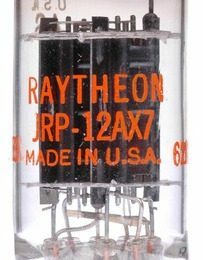 Currently costing over 240,-€ / each tube, We offer the last two Brand New & Matched 12AX7 JAN Raytheon 12AX7 dated 2/1962 at the fantastic price of 280,- euros for a last brand new, matched pair ! !